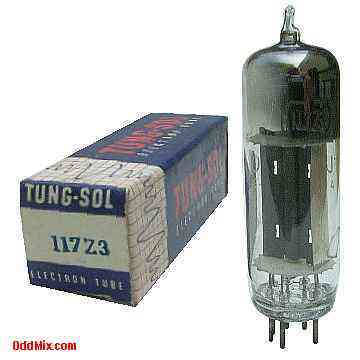 This is a genuine, vintage, discontinued Tung-Sol 117Z3 Full-Wave Rectifier electronic tube. These 7-pin miniature all glass tubes typically used to provide anode voltage for radios, television (TV), photomultipliers, instruments and special purpose circuits. Useful for antique radio restoration projects or to set up a private vacuum tube museum. For reference only - no longer available!